Monster Truck Madness #10 – Track Styles « Big Squid RC – RC Car and Truck News, Reviews, Videos, and More! When two r/c monster trucks are together in the same place at the same time, be it toy grade or the latest 6S bashing animal, it’s only natural to want to race them. And if you’re gonna race them, why not use a makeshift course similar to the real thing? 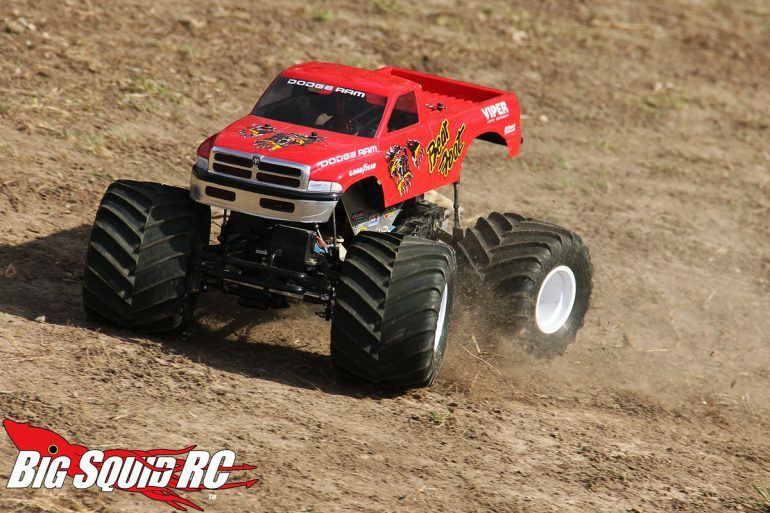 Whether you are just having some fun at the bash spot with buddies or looking to build a track for your solid axle trucks to race on, hopefully you’ll get a few ideas after reading through this. Here are some of the most popular full size layouts that can be easily translated to r/c, with a little historical information to boot. Thanks to all the YouTubers for posting these videos that I’m using as examples. Arguably the most used non-drag racing format in monster truck history, Chicago Style gets its name from early competition at smaller buildings in that region of the country (see example below). It became very popular back then because it was simple and maximized floor space. Both trucks start in different lanes at opposite ends of a track and then “chase” each other for a given number of laps, turning left. The finish line is usually in the center of the cars. This layout is still used by many promoters, both in small arenas and large stadiums. All you need is two ramps and two turning poles and you are ready to go! This style track was popularized in the late 90’s when the Monster Jam circuit starting running the big TWA Dome in St. Louis, MO. It features both vehicles making a complete lap-and-a-half around a similar course, save for one lane turning right and the other left. This was popular for around 10 years (I still LOVE it) but you don’t see it that often anymore. Here’s an example of Goldberg racing Predator from back in that era. Fun fact- I attended this show! Drag racing is pretty self explanatory. Both trucks lineup and go straight to a finish. However, PENDA-style drag racing, made famous from the PENDA Points Series that the monsters ran throughout the mid 90’s, features a starting line, a jump, a flat middle area (known as no man’s land) and then a final jump to the finish. It’s a lot of fun to race r/c’s in this format as you have to settle the truck down in NML before hitting the second jump. Or you can just pin it and hope it sticks! The biggest monster truck event in the world, the Monster Jam World Finals, has been run every year since 2000 in Las Vegas, Nevada at Sam Boyd Stadium. The racing layout has always been the same- a long straightaway with a chicane followed by a J turn. It’s noted for its high speeds, great racing and spectacular crashes. If you have high powered brushless trucks, this layout is a blast. You only need two ramps and a few turning poles/cones as well. When two fast trucks are going WFO into a 90 degree turn, well, crazy stuff tends to happen. Any of these layouts can easily be adapted for r/c monsters and make for exciting racing with your buddies. If you don’t have dirt, use wood ramps and your cul-de-sac. It’s a lot of fun lining up your 1/10 or 1/8 like a 1/1!